Pennsylvania artist, Deena Ball is both a full time artist and an art teacher in the North Philadelphia school system for the underserved. 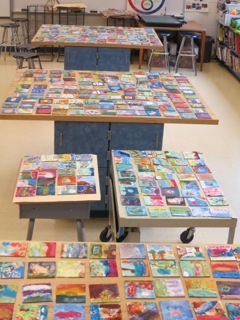 She also teaches her own adult and children’s workshops. Recently, she took her teaching to a much larger scale and applied for the artist in residency program at Erdenheim Elementary school. Not the typical residency, Deena had to apply with a project laid out to create and display the art of the student body. She found a creative way to limit the budget and display all 692 works of art in the school hallways for permanent display — by using Aquabord™. 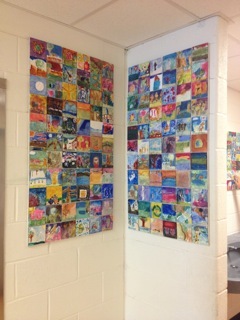 The school had originally planned to collage some of the work and frame it under glass. But Deena wanted to show every student’s work, and have every student complete their own piece so they would have some ownership. She knew of Aquabord and had used Claybord in some in her own work, enjoying the contrast of the smooth surface with the acrylic gels she uses in her painting. It was a logical choice to purchase cradled pieces so there would be no need for framing and cut down the cost. When Deena showed up for the beginning of the residency, the students had completed their simple line drawings and then the process with her began. The students transferred the works to the boards, and then used acrylic gel and acrylic gesso to create layers of texture, hills and valleys. Since the texture needed a bit of drying time, Deena had some volunteers take the pieces away to blow dry them. While the texture was drying, she spoke to the students about watercolor paints and how to use them. When their boards came back dry, she showed the students how to apply the paint. Students used Winsor Newton watercolors and Daniel Smith luminescent paints; some even used watercolor pencils. 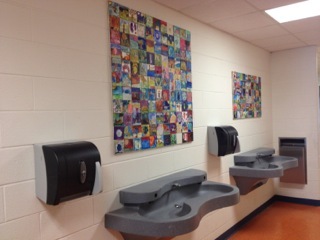 The pieces were finished with Lascaux UV finish and hung in series in the school hallways. The August 2013 issue of Watercolor Artist magazine shows a step by step tutorial on how Deena completes her paintings, which is the same process she shared with the students. You can see a video preview of the magazine on the ArtistsNetwork website. Deena has upcoming workshops listed on her website, and you can see her work in person at the Hardcastle Gallery, Wilmington, DE, the Earth Wood & Fire Gallery in NewTown Square, PA, and the Frame Station Gallery in Berwyn, PA.